Elizabeth Barrett translated Aeschylus’ Prometheus twice: the first version was published in 1833 (Prometheus Bound and Miscellaneous Poems), whereas the second in 1850 (Poems). This paper analyzes the preface which Elizabeth Barrett wrote for the 1833 edition and which is a very interesting essay, both erudite and poetical. 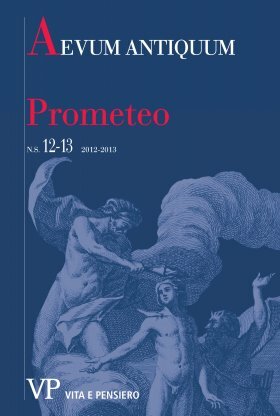 One of the aims of the preface is to give reasons for her translation: her version of Prometheus is accounted for by her observations on the theory of translation – especially by the defence of individuality and multiplicity –, and by her conception of classics as necessary tools in contemporary aesthetics. Secondly, Barrett recognizes Aeschylus’ excellence and, in particular, the Prometheus’ superiority upon his other tragedies in the fact that the Titan is the only heroic character with whom the reader identifies emotionally and exclusively. The last and most important contribution of the preface lies in the fact that it provides a justification for Barrett’s decision to include, after Aeschylus’ translation, her own poems: she accomplishes this in asserting the right of making her personal voice heard.